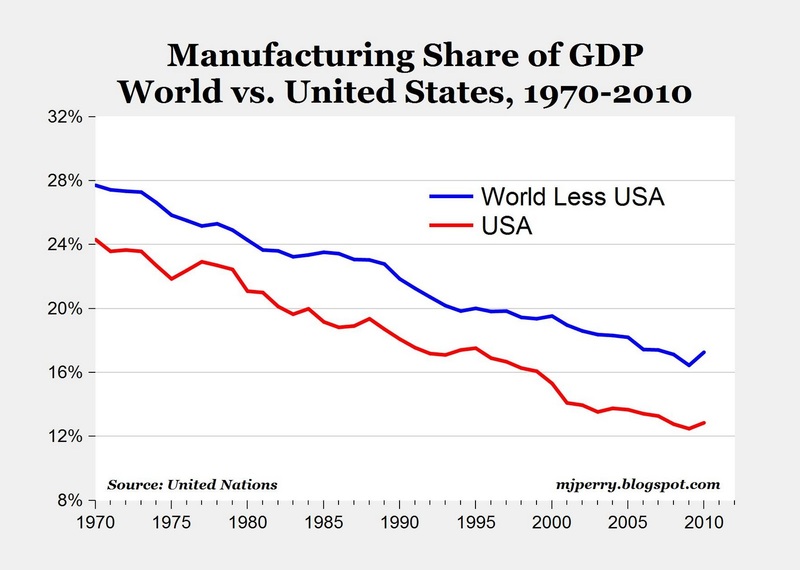 The chart above shows manufacturing output as a share of GDP, for both the "world less the U.S." and the U.S. alone, using United Nations data for GDP and its components at current prices in U.S. dollars from 1970 to 2010. We hear all the time from Donald Trump and others about the "decline of U.S. manufacturing," about how nothing is made here any more, and how everything that used to be made here is now made in China and other low wage countries. An underlying assumption of most of those claims is that if the manufacturing base is shrinking in the U.S. (the "hollowing out of U.S. manufacturing"), that there is an offsetting manufacturing gain that is captured elsewhere in the world, as manufacturing output supposedly shifts from the U.S. to other countries, with world manufacturing remaining constant. 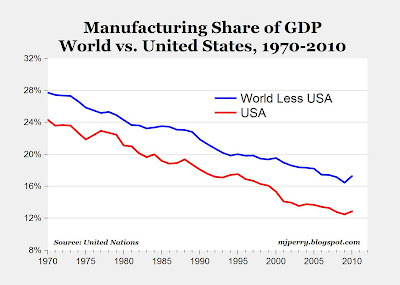 In reality, the chart above shows that the decline in U.S. manufacturing as share of GDP between 1970 and 2010 is really a global phenomenon as the entire world becomes increasingly a service-based economy. The manufacturing/GDP ratio in the U.S. fell from 24% to 13% between 1970 and 2010, while the world ratio fell at almost the same rate, from 27% to 16%. As a share of GDP, manufacturing has declined in most countries since the 1970s. A few examples: Australia's manufacturing/GDP ratio went from 22% in 1970 to 9.3% in 2010, Brazil's ratio went from 24.5% to 13.5%, Canada's from 19% to 10.5%, Germany's from 31.5% to 18.7%, and Japan's from 35% to 20%. Bottom Line: When we hear claims that "nothing is made here anymore," it's not really the case that somebody else is making the stuff Americans used to make as it is the case that we (and others around the world) just don't manufacture as much "stuff" any more in relation to the growing levels of national income, which the graph above clearly shows. The main reason that the manufacturing/GDP ratio has declined in the U.S. and around the world is that productivity gains for durable goods have significantly lowered the price of those goods relative to: a) the prices of services, and b) household incomes, as I pointed out in this CD post on the "miracle of manufacturing." In other words, the declining manufacturing/GDP ratio reflects declining prices for manufacturing goods, which is a sign of economic progress, not regress. The standard of living around the world today, along with global wealth and prosperity, are all much, much higher today with manufacturing representing 16% of total world output (including the U.S.) compared to 1970, when it was almost twice as high at almost 27%. And for that progress, we should celebrate, not complain about the "decline of manufacturing." What definition did the U.N.use; just in case one wonders? "International Standard Industrial Classification (ISIC) of All Economic Activities, Revision 3. It is defined as the physical or chemical transformation of materials of components into new products, whether the work is performed by power- driven machines or by hand, whether it is done in a factory or in the worker's home, and whether the products are sold at wholesale or retail. Included are assembly of component parts of manufactured products and recycling of waste materials." This seems broad enough to include even Apple, Inc.
assuming GDP is increasing over that period and the SHARE of it attributes to manufacturing is falling.. what is increasing? awesome chart by the way. kudos. and I agree with Buddy... do we not classify software development as "manufacturing" ? what is it classified as if not "manufacturing"? Why do you guys even care if software development is included in manufacturing? If software is wrongly included in these figures, then that means the real manufacturing figures are even worse, as software is a fast-growing field. for me - the chart show manufacturing is in decline worldwide. that - despite the fact that overall the world's economies are still growing (not without fits and starts). OR.. that there is still manufacturing going on but it's classified as something else. either way.. I'd be curious to know what the something else is. what are we "producing" if not manufactured stuff? China is at 43% manufacturing of its GDP, what is wrong with the Chinese !!! Their economy will never grow like the U.S. economy, unless the stop manufacturing so much. GDP represents the value of goods & services produced in the economy. If they didn't have value, people wouldn't buy them. U.S. manufacturing has become a smaller share of GDP, in part, because of "outsourcing:"
"It is important to remember that much of the change in industrial employment is an effect of changes in the classification of various jobs. Big companies used to do everything in house, so that people like janitors and accountants were classified as "manufacturing" workers simply because they worked for manufacturing companies. Over the years, such companies discovered that it was more economical to outsource such work. That is why "business services" is one of the fastest rising categories of employment in the United States." No, it doesn't. Manufacturing is increasing all over the world. In the United States alone, manufacturing output has doubled since the seventies. The chart shows that other sectors of the economy have grown even faster than manufacturing. That's not hard to understand given that the capital thrown off by it has allowed man to indulge in occupations that were once impossible to afford. >>> U.S. manufacturing has become a smaller share of GDP, in part, because of "outsourcing:"
Oh, geeez are you inside an impenetrable force field or something? Not read a single one of Dr. Perry's posts on not just oursourcing, but the return of formerly outsourced manufacturing to the USA? Anytime what you do does not actually produce a physical object, yet the thing you produce has value (i.e., software is a clear example -- the software is NOT the disk it's on, or the hard drive it's stored on -- it's the electronic representation held therein. Its the chief issue about which piracy rolls around), then THAT is the thing filling the gap. And it represents a MUCH greater percentage of ALL new wealth created in the world these days than manufactured goods do. So we are now in an "IP & Service Economy", not an "Industrial Economy". As I'ev noted elsewhere, given time, the percent of the populace devoted to "making things" will drop to the same range (i.e., 2%-5%) of the economy that agriculture does. If you want to see the factory of the future, go see Minority Report. It's fiction, but you can bet that's what it'll look like 20-50 years from now. There's a difference between "outsourcing" and "offshoring." I doubt there will be a reversal of outsourcing. those are good! thanks for sharing. I think they clearly show that few predicted the depth of the economic collapse and thus grossly underestimated unemployment as well as stimulus impact. I have a quibble with the "wealth" chart that ends at 1996-1997.
isn't there more up to date data on that? Larry wants to know what has replaced manufacturing, I suspect he already knows the answer, information and services, as OBH is always quick to point out. not only what has replace manufacturing in the US but in all the other countries that have also shown reduced manufacturing as a percent of their GDP. I can understand the US but is that same phenomena in play everywhere else also? sounds a little funky to me. right - but what is replacing the decline of manufacturing in other countries that still are growing? is it the same thing going on in this country?